Winging Point is a challenging 21 km coastal hike. The first section of this trail follows an old cart path through windswept forest to the original settlement of Gull Cove. This section is known as the Gull Cove Trail. The first 2.5 km’s tend to be quite wet and most times sticking to the footpaths on the left side of the puddles/water is the driest option (August 2013). Once you come out of woods, the trail follows the coastline until you cross three bridges (in working order as of summer 2018). From there keep an eye out for many old foundations and walls, these are part of the abandoned village of Gull Cove. You continue on making your way towards Bull Hill and onto Bear Cove, which is 5.8 km’s from the start and a great place for a snack. The second section of the trail, the remaining 5 km from Bear Cove to Winging Point, is done by walking along the beach. You must travel over various different types of cobblestone and sand beaches for the first 3.5 km’s. 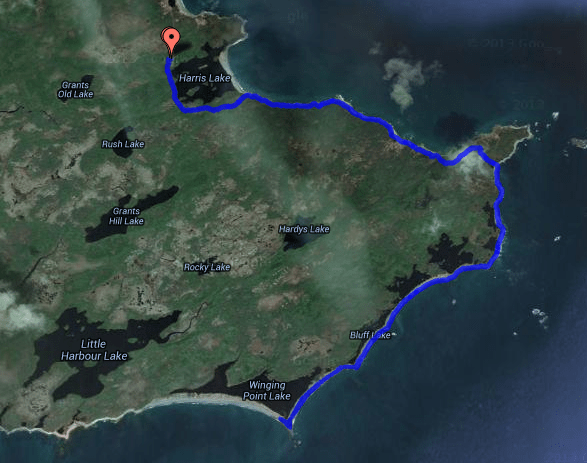 After that, it is a 1.5 km sandy beach walk to the amazingly remote Winging Point (10.51 km’s from the start). Retrace your route to return.